Mouse over the image to see the difference in the Greenland ice sheet between September of 1979 and September of 2007. After about 2,000 years of little change, global sea level rose over the past century at an average rate of 1.7 millimeters per year. Over the past 15 years or so, it has been rising at an increased rate of about 3.1 millimeters per year. Mouse over the image to see the difference in the Muir Glacier between 1941 and 2004. Global warming causes sea level to rise in two ways. First, over the last 50 years, the oceans have absorbed more than 90 percent of the heat that has been added to the climate system due to the build-up of heat-trapping gases. As ocean water warms, it expands, taking up more space and causing its level to rise. Warming has been observed in each of the world’s major ocean basins and has been directly linked to human influences. Second, warming leads to the melting of glaciers and ice sheets (ice on land), which raises sea level by adding more water to the oceans. 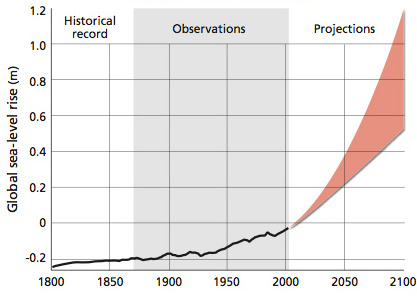 Glaciers have been retreating worldwide, and the rate of retreat has increased in the past decade. The world’s two major ice sheets on Greenland and Antarctica are now losing mass. 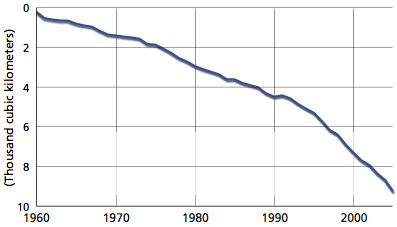 Glaciers have been retreating worldwide, and the rate of retreat has increased in the past decade. 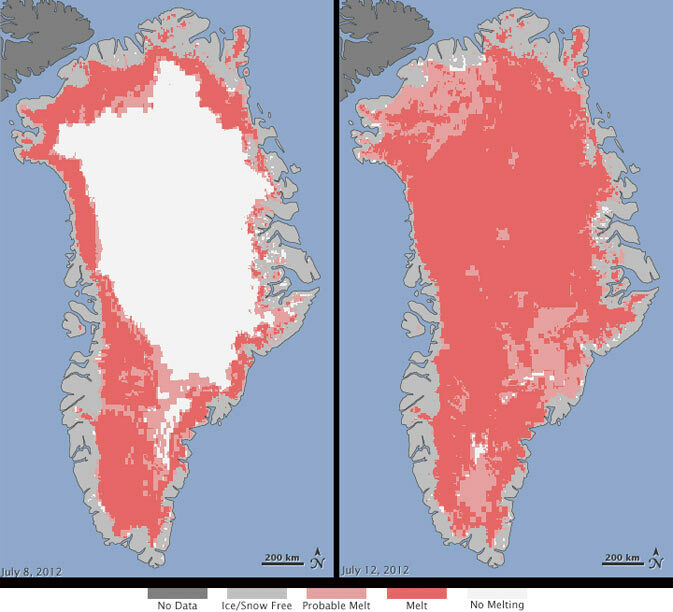 Extent of surface melt over Greenland’s ice sheet on July 8 (left) and July 12 (right), 2012. Measurements from three satellites showed that on July 8, about 40 percent of the ice sheet had undergone thawing at or near the surface. In just a few days, the melting had dramatically accelerated and an estimated 97 percent of the ice sheet surface had thawed by July 12. In the image, the areas classified as “probable melt” (light pink) correspond to those sites where at least one satellite detected surface melting. The areas classified as “melt” (dark pink) correspond to sites where two or three satellites detected surface melting. The satellites are measuring different physical properties at different scales and are passing over Greenland at different times. As a whole, they provide a picture of an extreme melt event about which scientists are very confident. Nicolo E. DiGirolamo, SSAI/NASA GSFC, and Jesse Allen, NASA Earth Observatory.